No matter what your reason is for hiding your friends list this Guide on How to Hide Friends on Facebook will show you the quickest, easiest way to hide your friend list. There are actually two different ways you can get to the Edit your Privacy Settings for Friends. 1. Make sure you are on your Personal timeline. Click on your Friends tab located under your Cover Photo. Look to the left hand side of your Timeline and locate your Friends List. Mouse over it and the little pencil icon will pop up. Click on it then click on Edit Privacy. 2. Once on the Friends Tab you’ll see that little pencil located at the top right of your Friends List. Click on that and you’ll have two options to choose. Choose Edit Privacy. 3. Next you’ll have an Edit Privacy Box pop up. Where it ask Who can see your Friend List you want to click on the blue box and you’ll get the following drop down. If you select Only Me then no one else will be able to view your friend list. Keep in Mind: Your friends control who can see their friendships on their own timelines. So if you are friends with those that allow everyone to see their friend list then you will show up there. There you have it! 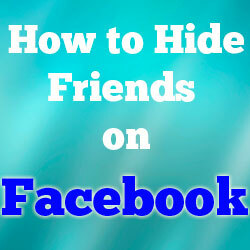 The quickest way to hide your Friends list from others seeing it. Do you have a Facebook Question? Been wondering how to do something on Facebook and don’t know how? Leave me your questions in the comment box and I’ll do a tutorial or video showing you how to do it. Hi,my question is this…someone from the past semt me a message (we are not friends on FB). However, if i remember correctly i send a reply. Where do i find my message i sent? Try one of these three ways and let me know if they worked for you. 1. While on your Home screen click on Messages located at the left under Events. You can use the search bar and type in the name of the friend you want to find that you messaged or simply scroll through your inbox to find it. 2. While still under the Messages tab click on the other box and see if the conversation is in there. Hopefully you can retrieve the message through one of these three ways. If not let me know and I’ll do some more digging.